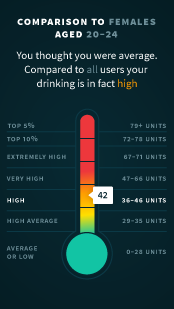 Our comparison puts your drinking in perspective, showing how you measure up against relevant peer groups of age, sexuality, and location. 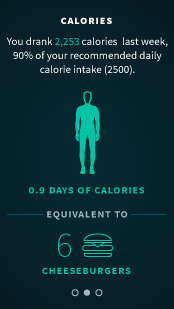 How many cheeseburgers did you drink last week? 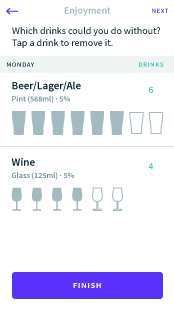 Drinks Meter tracks the calories you’re drinking and feeds back with realistic representations. 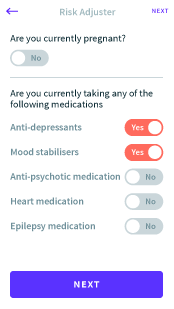 We measure risk based on your health factors, this means we’re able to give truly personalised results free from cookie cutter government guidelines. Set targets your own targets for the week ahead. No prescribed plans, you choose what you think is unneccesary so you can still have fun when you want to.